I’ve just finished the schoppel socks, so I think I will concentrate on the olive cardigan to see if I can get it finished in the next week or two. It’s going well so far. I am adding a bit of waist shaping in this one to get a slightly closer fit. I’ve been thinking of making a little summer top in hemp yarn for a while now. I bought some allhemp6 from lanaknits a few months ago, and bought a pattern with it to make a top down seamless knitted tee-shirt. It’s a really nice pattern, but I’ve already got quite a few similar tops, and I feel like making something different. I saw this on ravelry recently and I think it would work well with the yarn. I’m not sure whether to try it, or try to make up my own design – we will see! I really enjoy seeing other people’s versions of my designs, particulary when they have done something different with them. There is a lovely version of Eva’s shawl on daisyfrog.blogspot.com in worsted weight alpaca. It looks lovely and cosy. 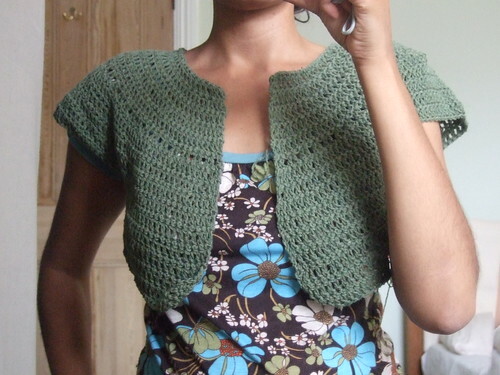 Hi………love the Olive Cardi!………will you please publish directions??? My 15 yr old granddaughter wants to make this herself!!!! Hi Milobo! I’ve just tagged you! Read the latest meme on my blog (actually on just about everybody’s blog). NB My Eva’s is almost finished! Beautiful cardi and it fits you so nicely-great job!